We see ahead to a time when the natural environment throughout England, Scotland, Wales and Northern Ireland is managed so as to deliver greater wellbeing and prosperity for everyone. The environment underpins our quality of life, our health and our economy. In our work to deliver our vision, we are driven by the ecosystem approach. This is a framework for considering the environment as a system and recognising the services that nature provides. A desire to see greater practical application of the ecosystem approach was one of the main reasons why the Ecosystems Knowledge Network was initiated by Defra in 2011. The ecosystem approach guides how we plan and manage the environment for the benefit of society, for now and for future generations. It promotes equitable sharing of the benefits we get from nature and encourages participation from all in decision-making. Holistic - it considers the environment as a system (an ecosystem). Inclusive – it recognises that everyone’s knowledge and know-how has a place in decisions. Adaptive – it emphasises that we need to keep on learning, based on experience. The ecosystem approach does not replace the many strategies and methods already in place to improve the way people work. Instead, it is intended to inform everyone’s thinking about how the environment is connected with society. The ecosystem approach is a set of 12 principles adopted by the international Convention on Biological Diversity as its primary framework for action. It is more specific than the global vision for sustainable development, in which environmental, economic and social considerations are often portrayed as competitors. For the original text of the Convention on Biological Diversity see the CBD webpage. 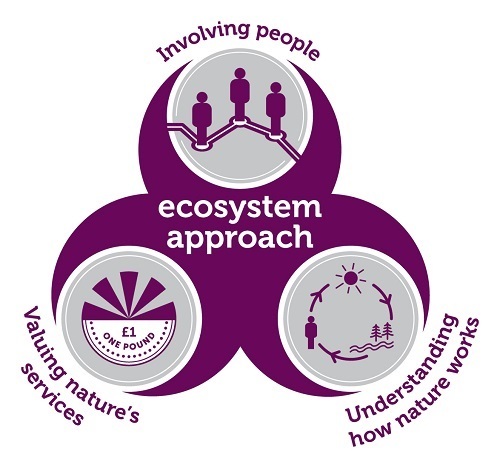 The above simplified wording for the ecosystem approach principles is found in the Evaluation Framework published by Scottish Natural Heritage. 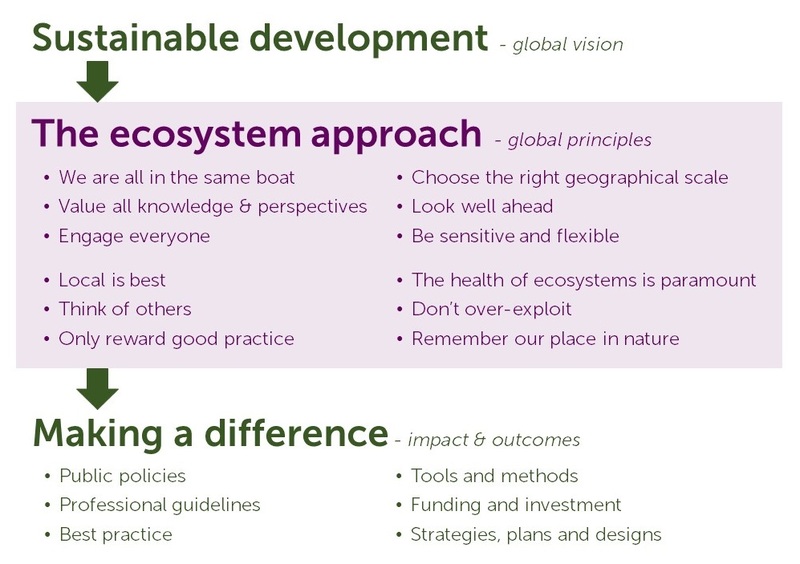 See also our links to guidance on how to communicate the ecosystem approach and its development. The ideas in the approach are relevant to professionals, disciplines and organisations that have some influence over the planning and management of our land, coasts and seas. Application of the approach often involves collaboration between people with diverse interests such as health, economic development, planning, design and nature conservation. There is a tendency for individual sectors or organisations to focus only on the issues important to them, for example, adapting to climate change, increasing food security, or promoting better health and wellbeing. The ecosystem approach is a framework for managing the relationship between people and the environment. It helps us put the global vision of sustainable development into practice. While the term 'ecosystem approach' is used infrequently, the ideas behind it are already reflected in the projects and initiatives of various professions, social movements and public policies. These include, for example, measures to ensure the sustainable management of natural resources in Wales. The ideas are also reflected in many principles of good design and planning for the built and natural environments. Our Resources by theme page provides links to resources on how to apply the ecosystem approach, and how it is relevant in different environmental settings. This is our infographic to summarise the ecosystem approach.